The cabin was spacious, well equipped, and clean. The stay was very comfortable despite the rainy weather. We stayed 2 nights. We had a very spacious room. I feel the only other thing I would like to have is a water view. Where to find Rocky Harbour hotels near an airport? Where can I find hotels in Rocky Harbour that are near tourist attractions? Planning to spend some time in Newfoundland? Hoping to reserve somewhere to stay in the Rocky Harbour area? Within a 0.1-kilometre (0.06-mile) radius of the city center, you can find 2 Expedia-listed accommodation options. There are a handful of accommodation options within easy walking distance from the center of Rocky Harbour. 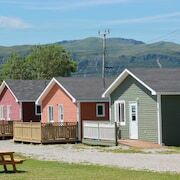 The Gros Morne Suites is an ideal choice as it's only 3 kilometres (2 miles) away. 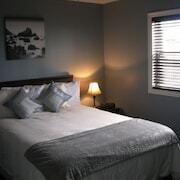 The Gros Morne Suites is located 0.8 kilometres (0.5 miles) from the heart of Rocky Harbour. 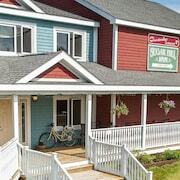 7 kilometres (5 miles) away is the Sugar Hill Inn which is an alternative. Once you have explored Rocky Harbour, why don't you go a little more of the area? The Newfoundland area has many things to see. Visit Newfoundland's old towns and cathedrals and admire the area's rivers and streams. Common things to do in this particular part of Canada include snowboarding, skiing and cross-country skiing. The closest places to stay in Newfoundland are Steady Brook and Corner Brook. Steady Brook is 70 kilometres (44 miles) to the south of Rocky Harbour, while Corner Brook is 70 kilometres (45 miles) to the south. Steady Brook accommodations are the Marble Villa at Marble Mountain Resort and Marble Inn Resort. The Glynmill Inn and Comfort Inn are some of the accommodation options in Corner Brook. Just because you're on vacation, doesn't mean you can't enjoy your passion for sports. You'll find My Newfoundland Adventures 75 kilometres (45 miles) to the south of Rocky Harbour. Stay near the action at the Grenfell Campus Summer Accommodations or the Greenwood Inn & Suites. For those travelers planning on flying via Deer Lake Regional Airport, you may choose to book a room at Holiday Inn Express Deer Lake, or Deer Lake Motel, both of which are a short distance away. Are there hotels in other cities near Rocky Harbour? What other types of accommodations are available in Rocky Harbour? Explore Rocky Harbour with Expedia.ca’s Travel Guides to find the best flights, cars, holiday packages and more!